The CCCC Name: Caulfied or Carnegie first? Q: Even today I hear people refer to the club as Caulfield Carnegie Cycling Club. 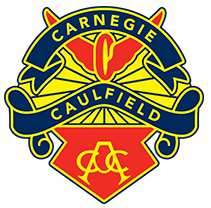 The history page has the logo showing “Carnegie and Caulfield”, but the text says Caulfield Carnegie Amateur Cycling Club. Were Caulfield & Carnegie ever separate clubs? Why is one suburb shown before the other? What were the club’s various names through time, when were they changed and why? A: As best as I’ve been able to determine over the years (much of the clubs memorabilia was lost in a fire at the old club rooms at Packer Park), Carnegie was the amateur club and Caulfield was the pro’s. The merge of the 2 clubs was apparently pretty ground breaking as it preceded the UCI directive to end the distinction between the amateur and professional bodies world wide. Our registered name since the merge is Carnegie Caulfield Cycling Club Inc, but the old timers who came from the pro side of things have always referred it the other way round, and it’s a hard habit to shake. I finally got Matt Keanan to change but he’s not doing much local commentating anymore! Jack McGowan has an amazing memory of this sort of thing – he recently gave me an old club minutes book which had the date of the merge, and from this I put the following para together to answer a question from one of the government bodies we deal with. The Carnegie Caulfield Cycling Club was founded in 1924 as the Carnegie Amateur Cycling Club. The advent of Open racing saw the Carnegie Amateurs merge with the Brighton-South Caulfield Professional Cyclists Association in July 1984, and adopt the name “Carnegie Caulfield Cycling Club Inc”. It also sounds like that in the era after WWII, many of the other pro clubs in the area amalgamated with Brighton-South Caulfield, which was the strongest, due to a lack of officials and volunteers – some things never change! Thanks to Sean Roberts for sending through these great photos featuring his grandfather Vin Murphy. Also great to see what our long serving past president Jack McGowan looked like in his racing days – most of us are more familiar with him these days as a marshal at Glenvale every week. We’re always thrilled to receive history and memorabilia relating to the club. Thanks to Mick Hollingworth for sending in his photos. Click on the thumbnails to view full size. Thanks to Tom Moloney for sending in his photos. Click on the thumbnails to view full size. Thanks to Gary Woodfall for sending in his photos. Click on the thumbnails to view full size. Thanks to Chris “The Snake” Salisbury for lending his photo albums for scanning. Click on the thumbnails to view full size and read the commentary provided by Mike Goldie. Thanks to Hilton Clarke for some great photos from his own collection. Click on the thumbnails to view full size and read the commentary provided by Mike Goldie. Thanks to Mike Goldie for getting the ball rolling and submitting the below photos from his own collection. Click on the thumbnails to view full size and read the commentary. Team Melbourne Elite Sport, Circa 1995/96 Summer at Carnegie Velodrome.